When traveling, I always try to find things that are made locally....as opposed to a London key chain that's made in China. In Aruba and Curacao, this was a challenge, as they are small, dry islands where almost everything is imported. With a little hunting, I brought back Aruba Heat﻿ sauces, CurAloe lotions, and of course, the original Curacao Liquor (which doesn't have to be blue). Before Christmas I did a little shopping in Georgetown, Colorado, and found some made in Colorado treats. I'd been to the Georgetown Valley Candy Company before. Scotty G's Toffee Fudge Sauce (picture, left) was my most recent find, along with the Coconut Supreme candy which my sister loved. 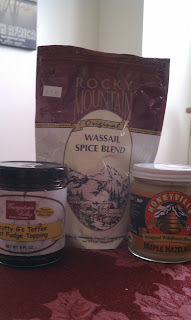 I found the Rocky Mountain Wassail and the Honeyville Hazelnut Maple whipped honey at a little Scandinavian market called Kneisel & Anderson.